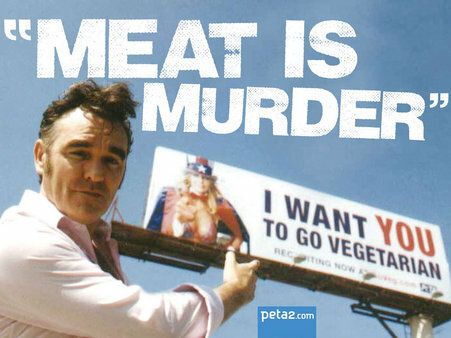 Morrissey and The Smiths promoted vegetarianism. I began loving The Smiths back in the '80s. MEAT IS MURDER stickers covered my school binder, yet I wasn't a vegetarian. I've always had a high level or respect for vegans and vegetarians. When I heard about Joanne Rose and her Vegan 101 sketch comedy web series, I was curious to talk to her about her project, her choice to go vegan and working with Eric Roberts. Learn more about Vegan 101 at VeganVision.net. When did you first become a vegan? Are you vegan for health, humanitarian or both? Joanne: I became a vegan in 1994 first and foremost because of my deep love for animals. Joanne: River Phoenix was my greatest inspiration to going vegan. I learned a lot about the vegan lifestyle and the realities of the way animals are treated through interviews he'd done. Would you say it is much easier today to find vegan-friendly foods and fashions, than it was back in the ‘80s? I remember how it was so cool that Doc Marten made vegan Doc Marten shoes back in the days. Joanne: Vegan products are largely available today than they were in the early '90s, making it more accessible. Back in the day, vegan food was limited to health stores compared to the supermarket chains we have today. There was also one brand of everything then, whereas now we see such much more variety. I reall having to make my own vegetable burgers back then. It is also wonderful to see so many vegan companies today providing a beautiful range of vegan fashions. How did you come up with the cool idea of a sketch comedy? Joanne: As a vegan you get used to hearing the same questions and comments from people unfamiliar with the lifestyle. Instead of being offended by it, I decided to have fun with it and created Vegan 101. The series launched online in mid 2009. The show consists of exaggerated parodies of veganism from all walks of life in various situations through stand alone sketches to combine both fun and vegan knowledge. The story lines will inspire others to see the comedy in aspects of their lives and may inspire you to go vegan. What was it like working with Eric Roberts? How did that come about? Can you tell us your favorite Eric Roberts movie from back in the day? I loved him in Raggedy Man – Henry Thomas from ET starred alongside him in that one way back in ‘81. Joanne: Eric Roberts is an absolute delight to work with. He is such an incredibly warm, friendly and funny person. He gives a side splitting performance as Dr. Eaton Wright and will have audiences in fits of laughter. He is an incredibly talented and versatile actor whose passion and dedication to the craft is evident in each role he takes on and his commitment to the vegan lifestyle and animal rights was the ultimate choice for Season 2. My favorite movie of his from back in the day would be Star 80. 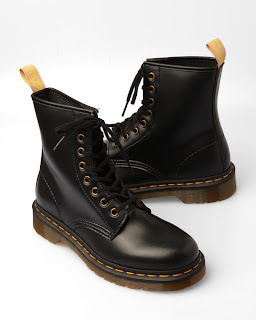 I so want those Docs! Do they still make vegan Docs? Yes, Riot! They still sell them! LOL! I had a bright purple pair of Docs when I was a teen! Thanks for the stroll down memory lane! I have talked my daugter out of even considering being a vegan (for now),she is 13. I think it's great though. Hey, I also love Judy Blume. I remember the summer when I discovered her books. I was never totally vegan, but I only started eating meat about 10 years ago. It was like I didn't have a choice in the matter. My body was craving the protein (my doctor said). I tried to eat many other sources of protein, but they didn't cut it. Now, i don't even remember what it was like not to eat beef. I remember the "MEAT IS MURDER" stickers. I also remember the, "MEAT IS MURDER" "Sweet Delicious Murder" stickers.